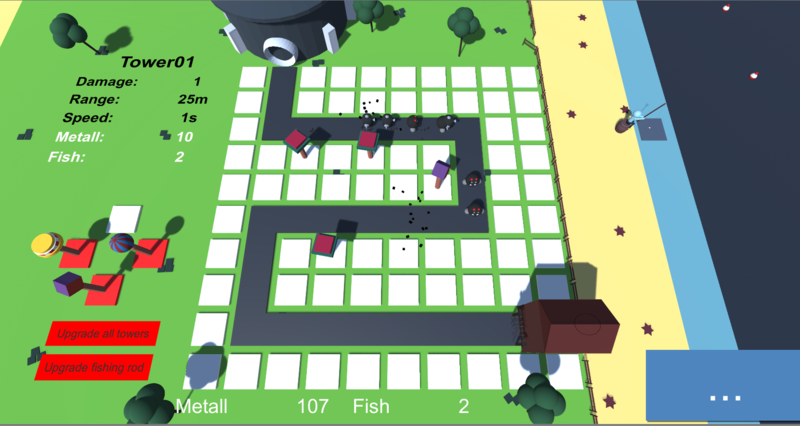 We made a genremix tower-defense x fishing. Very fun once you get into it, having to manage fishing and tower defense at the same time is good fun and engaging, pretty hectic too! Although I do agree with others saying that a smoother difficulty curve would be nice. Also, I was having issues catching fish consistently (maybe my timing is just a bit off). Having different sounds for successfully/unsuccessfully catching a fish would be good too. Thank you very much for playing. There is a sound for the fish getting away or getting caught, but it might be to quit for some systems. It's planed to add sound options. Thank you very much for playing and your feedback. Very cool idea! Took me quite a while to familiarize myself with the towers and how to successfully beat a wave. Maybe if you could pause between waves or even just have a little more time between to set yourself and place some towers? Other than that, I love the concept and it's quite a lot of fun. Also, thanks for playing my game, and for your feedback. Much appreciated! Thank you very much for playing and your feedback. The pressure with the waves is part of our gameplay, but I agree that you should have more time for the first wave. Wow, thank you so much for playing and your awesome feedback! We really need to work on a tutorial for this game. I never thought that so many people would have an issue with it. But that's why you test your game early. I'm not sure, if a set order will fix the issue, but I understand why it might help. It's nice to hear that you also like the visuals and music, because we did everything alone (kinda extreme for a first game). 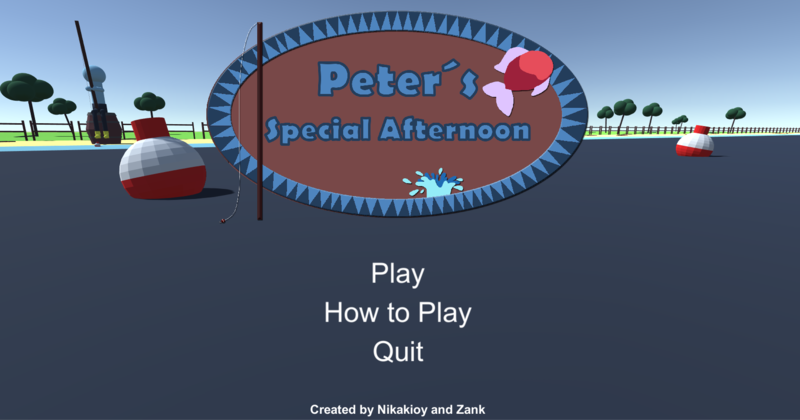 We plan to continue working on the game, but after the rating is over and when we have more time. It is too crazy to do the tower defense and fishing at the same time... Nice interpretation on the theme. Thank you for playing and your feedback even though I'm not sure, if too crazy is a good or bad thing. I kept dying at first and had a blast laughing at the confusion. Once I got the hang of it, it felt great managing resource and killing enemy! I survived all waves but the game didn't end. Thank you for playing and good job on beating the game! Yes, there is currently a bug with beating the game. When you die in any level the game doesn't trigger the end for that level. I'm not sure why it happens, but that's the first thing we try to fix. One player of my game said that it crashed after they shot at the enemy. I tried to break it so many times and it didn't happen. Now I am pulling my hair trying to figure out what the specific steps I need to follow to break my game so that I can fix it! It felt a bit too difficult, but I liked the graphics and gameplay. Thank you for playing and your feedback. I agree with the fishing. A chance of 50% / 70% doesn't really feel like 50% / 70%. It is possible to beat each of the 3 levels, but I think we should have added some kind of tutorial levels. So you get used to the towers / mechanics. My tip for beating the levels is to place the towers far away from each other and use Tower03, because the AoE is overpowered. Thank you very much for playing and your awesome feedback! That really motivates us to continue creating games / upgrade this game after rating is over. I'll definitely play your game. Pretty fun game! Greatly promotes multitasking, although it's a bit hard to understand at first. 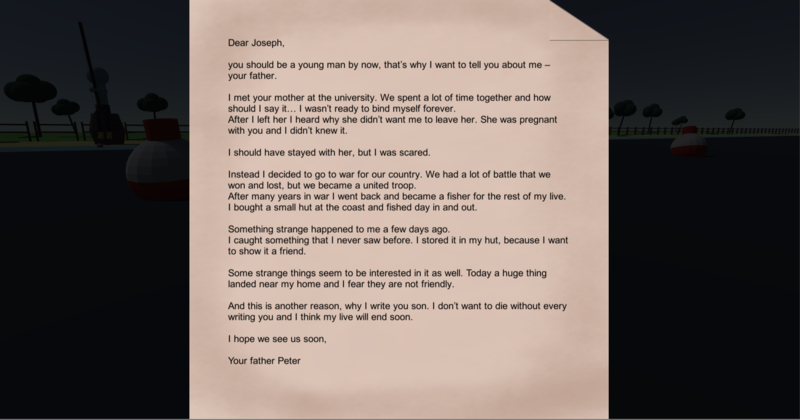 I feel the intro letter was completely unnecesary to the game. Once I got the hang of it I did have some good fun managing towers and getting fish to build them, although I feel the fishing mechanic could've been improved, something like requiring to press the fish key right when the fish shows up in a dark blue spot. It'd be awesome if you could also try our game! Some people said that the multitasking is hard, but it's nice to hear that everyone seems to learn it fast. Our earlier version had your idea of fishing, but it felt more like a task and not like gameplay. I saw your posts on twitter for the game and I definitely will play it. Divading attention by playing two diffrent games to improve both of them is grate. I got a blast and ton of laugh. Love it! Thank you so much for playing. It's nice to hear that you enjoyed it. And you are right it can be difficult to play two games at once, but sounds like you improved your skills. The combination of the two makes me laugh a lot, I really love it. I wish that the towers were more visually distinct based on what they did, and that their stats would display a lot faster (or even all the time). But the idea of doing something else to generate the resources used in a tower defense game is a really great one! Thank you so much for playing and the feedback. I hope you enjoyed it. Yeah, the towers are kinda abstract and are not really finished (Tower01 - 04, great names...).